One of the great things about this industry is that it constantly comes up with new solutions for everyday problems. One of the biggest difficulties for the industry is getting the word out to home and building owners. Take hot water recirculation, for example. There is probably not one homeowner or resident that thinks waiting a minute and a half for hot water to reach the tap isn’t a problem. The plumbing industry has a solution for that. In fact it has multiple solutions to fit the homeowner’s requirements and budget. And yet very few if any homeowners are aware that anything can be done. Waiting for hot water is just something that everyone puts up with. We have to do better. 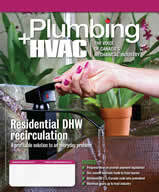 And, in the case of hot water recirculation, it’s largely up to local plumbing contractors to get the word out. Tell people in your advertising: “Tired of waiting for hot water at the tap? We have a solution!” People will be interested. And that goes for so many innovative things this industry does in plumbing, air conditioning, heating, indoor air quality, water treatment, etc. Homeowners have issues. These are often issues that they deal with every day, issues that make life uncomfortable but nothing is actually broken so they don’t call a contractor to fix it. People just put up with the reality that some rooms in their home are too hot while others are too cold. Or that the air conditioning doesn’t seem too effective in certain parts of the house – people just assume that nothing can be done, or that nothing can be done at a reasonable cost. But today, zoning with either forced air or hydronic systems is not that difficult or expensive. Our industry needs to do a much better job of educating the public about the solutions we can offer to everyday problems. When a contractor advertises its services, education should be a big part of it. If the homeowner knows there’s a solution, the sale will come. Barcelo May Palace, Riviera Maya, Mexico. Mississauga Convention Centre, Mississauga, Ont. For more information, visit your local Wolseley branch, call Laura Lapierre at (905) 315-3605 or e-mail onetradeshow@wolseleyinc.ca.